What a roller-coaster few weeks it has been for Colombian President Juan Manuel Santos. Last month he got a historic peace deal done with the FARC rebel group to end a 52-year long bloody conflict. In a surprise result, the Colombian electorate rejected the deal in a referendum on October 2. And now, Juan Manuel Santos is the winner of the Nobel Peace Prize for 2016 for his resolute efforts to find peace. The Norwegian Nobel Committee has decided to award the Nobel Peace Prize for 2016 to Colombian President Juan Manuel Santos for his resolute efforts to bring the country's more than 50-year-long civil war to an end, a war that has cost the lives of at least 220 000 Colombians and displaced close to six million people. The press release noted that this award should also be seen as a tribute to the Colombian people who, despite great hardships and abuses, have not given up hope of a ‘just peace’, and to all the parties who have contributed to the peace process. Tribute was paid, not least, to the representatives of the countless victims of the civil war. He initiated the 4-year long negotiations that culminated in the peace accord signed between the Colombian government and the FARC guerrillas on September 26, 2016. He did this in spite of knowing that the accord was controversial, even putting his political career at risk. It was clear he was willing to pay a personal price for peace. 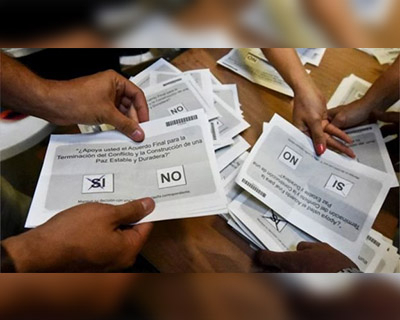 The committee also took note that the outcome of the referendum vote (on October 2) was not what President Santos wanted:a narrow majority (by 0.5%) of the over 13 million Colombians who cast their ballots said no to the accord. This award should encourage Colombians to pursue peace regardless of the result of the referendum. As is the case with every Nobel Peace Prize, even this award will have its share of controversy.But, in our opinion, the Nobel Committee should be congratulated for using Nobel Peace Prize as a motivator for taking the peace deal to conclusion. Also, the fact that the Committee took note of the recent developments indicates that the prize was decided at the last moment. It is good if the Nobel Peace Prize can be used as a tool to address a current problem in the path of peace. Santos is facing political back-lash. He stares in the face of possible electoral defeat in the next elections because his critics say he was ‘too weak’ in negotiations and his approach of ‘peace at any price’ was wrong. That he has become a Nobel laureate will motivate other leaders to not let political calculations come in the way of peace. Why is his achievement worthy of praise? Santos spear-headed long and often difficult negotiations to end the conflict with FARC. And he succeeded, more or less. FARC is among the oldest and the largest of Colombia's left-wing rebels and one of the world's richest guerrilla armies. Almost everyone in Colombia has either experienced violence or knows someone who has. Of the almost 220,000 Colombians who have died as a result of the conflict, around 80% were civilians. The horrible five decades (52 years to be precise) of conflict is close to over with the Colombian government and Revolutionary Armed Forces of Colombia (FARC) signing a peace deal in September. Colombia's President Juan Manuel Santos and the rebel leader Timoleon Jimenez, known as Timochenko signed the deal. The ceremony was full of symbolism - a pen made from a bullet to sign the peace deal, the singing of Beethoven's Ode to Joy, and everyone dressed in white. 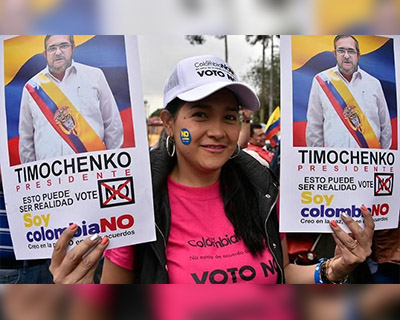 Timochenko said the FARC, which began as the armed wing of the Communist Party in 1964, was being reborn to launch a new era of reconciliation and of building. He also apologized to all the victims of the conflict. He said: "I would like to ask for forgiveness for all the pain that we have caused during this war”. 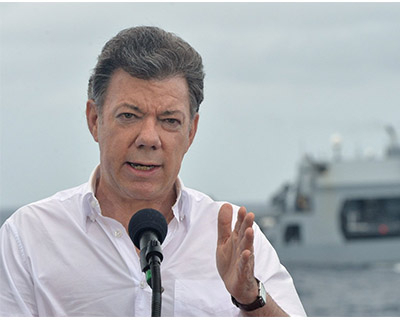 President Santos said:"Colombia celebrates; the planet celebrates because there is one less war in the world. We will achieve any goal, overcome any hurdle and turn our nation into a country we've always dreamed of - a country in peace." The peace deal was put to vote on 2nd October. Then the unexpected happened – by a razor thin difference, the Colombian electorate voted against the deal. Embarrassed but still determined, Santos has vowed to carry on the peace deal – though he knows he will have to face huge legal and political hurdles to cement the deal. 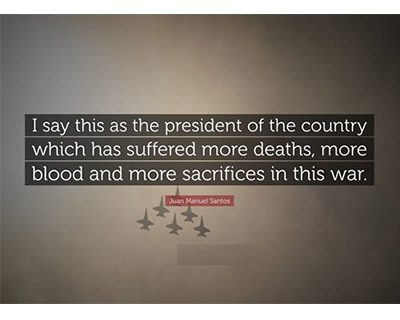 Santos’ relentless pursuit of peace deserves to end the war that was as bloody as it was costly must be praised. He wants the country to move on, though not everyone in his country feels his peace deal is ‘just’. When did Santos begin the peace negotiations? Having started peace talks in November 2012, the deal came after four years of talks in Havana, Cuba, between government and rebel negotiators.The key issues included what concessions to make to the rebels and what kind of justice they should face. Under the accord, the Colombian government will support massive investment for rural development and facilitate the FARC's rebirth as a legal political party. FARC has promised to help eradicate illegal drug crops, remove landmines in the areas of conflict, and offer compensation to victims.FARC leaders can avoid prosecution by acts of reparation to victims and other community work (this part of the deal has generated controversy). As per the accord, the government and rebels must also provide land, loans and services to impoverished areas to help local populations. It is the first time that the victims have been placed at the center of the solution to the conflict addressing their rights to truth, to justice, to reparations and to non-repetition. After this deal, the European Union removed FARC from its list of terrorist organizations, in a show of support for the peace deal. The US is also reviewing FARC’s terrorist status and has pledged almost $400m to support the peace deal. 2002: At its height, it had an army of 20,000 fighters controlling up to a third of the country. Senator Ingrid Betancourt kidnapped and held for six years along with 14 other hostages. 2016: Definitive ceasefire and signing of the peace accord (which was subsequently rejected in a referendum). Where does the criticism come from? Most of the people who voted "no" in the referendum said they thought the peace agreement was letting the rebels get away with murder. Under the deal, special courts would have been created to try crimes committed during the conflict.Those who confessed to their crimes would have been given more lenient sentences and would have avoided serving any time in conventional prisons. This, for many Colombians, especially those who have lost their loved ones to FARC’s atrocities, was one step too far. Many Colombians were also angry at the government's plan to pay demobilised FARC rebels a monthly stipend and to offer those wanting to start a business financial help. "No" voters said this amounted to a reward for criminal behaviour while honest citizens were left to struggle financially. 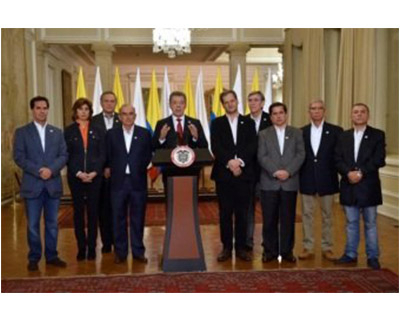 Others were unhappy that under the agreement, the FARC would be guaranteed 10 seats in Congress. They said this would give the newly created party an unfair advantage. Many also said that they simply did not trust the rebels to keep their promise to lay down arms for good. They pointed to previous failed peace negotiations when the rebels took advantage of a lull in fighting to regroup and rearm as evidence that the FARC had broken their word before. The No Voters were also worried the rebels would not turn over assets from drugs and illegal mining, potentially giving them a formidable war chest that could outstrip the coffers of traditional parties. And, therefore, as a political party, the FARC would be able to spend its way to electoral success. The fact, however, is that the only alternative to not pursuing peace is continuation of the war and greater loss of lives. There is no Plan B to peace. Who supports the peace deal? Santos appeared shocked after knowing that his people rejected the deal he had worked so hard to get. Then he resolved to not give up the pursuit of peace. He asserted that the cease-fire with the FARC, which has held for more than a year, would remain in place. He said he would convene all political groups, including the opponents of the deal, to discuss how to move forward. In a statement, even the FARC resolved to not give up on peace. “We know that our challenge as a political movement is even bigger and will require more strength in order to build a stable and durable peace.” Under the deal’s terms, the group had agreed to abandon its camps and hand over its weapons to the United Nations. The FARC also said that it would remain faithful to the accord signed with the government and called on Colombians to mobilize peacefully to support terms of the existing agreement. If the FARC still remains committed to peace, it is only because they believe that Santos means peace and will somehow get there. The United Nations applauded the maintenance of a ceasefire in Colombia despite the vote and said its special envoy, Jean Arnault, would also travel to Cuba to help the process. "We would have hoped for a different result, but I am encouraged by the commitment expressed (by Santos and Timochenko)," U.N. chief Ban Ki-moon said. "I count on them to press ahead until they achieve secure and lasting peace. White House spokesman Josh Earnest expressed U.S. support for efforts by Santos and other parties to negotiate and urged all sides to continue the pursuit of peace. He said that Washington was prepared to play a constructive role. "We're saddened by the slim victory for 'No'," said Ecuador's foreign minister, Guillaume Long amid a chorus around Latin America. Colombians, even those who backed the "No" vote, expressed shock at the outcome and uncertainty about the future. "We never thought this could happen," said sociologist and "No" voter Mabel Castano. "Now I just hope the government, the opposition and the FARC come up with something intelligent that includes us all." Let us not forget that the referendum was defeated by a wafer-thin margin. There is popular support for the peace deal. How controversial is the Nobel Peace Prize? 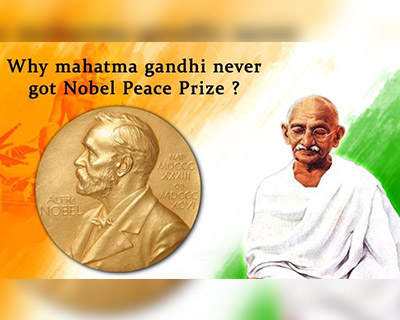 The Nobel Peace Prize is probably the most controversial Nobel of all —and the best justification of this argument is that Mahatma Gandhi – the greatest champion of peace the planet has ever hosted - never got one in spite of being nominated 5 times. Geir Lundestad, Secretary of Norwegian Nobel Committee in 2006 said, "The greatest omission in our 106 year history is undoubtedly that Mahatma Gandhi never received the Nobel Peace prize.Gandhi could do without the Nobel Peace prize, whether Nobel committee can do without Gandhi is the question." The Nobel Committee of 1948 may have tacitly acknowledged its error, however, when in 1948 (the year of Gandhi’s death), it made no award, stating "there was no suitable living candidate". Nobel Prize is not awarded posthumously. Criticism that have been levelled against some of the awards include allegations that they were politically motivated, premature, or guided by a faulty definition of what constitutes work for peace. For example, the 2009 prize went to Barack Obama "for his extraordinary efforts to strengthen international diplomacy and cooperation between peoples". The award, given just nine months into Obama's first term as president, received criticism that it was undeserved, premature and politically motivated. In 2009, New York Times ethics columnist Randy Cohen argued that "the prize should be taken back in those extreme cases when a past winner has repeatedly acted contrary to the values the prize enshrines." He suggested a few possibly unworthy winners, including President Teddy Roosevelt, Henry Kissinger, and Yasser Arafat. (According to the Nobel Prize rules, a prize cannot be taken back.) Many people would now recommend adding Barrack Obama to this list. He has bombed quite a few people during his tenure. One person – and only one – declined to accept the Nobel Peace Prize.